This excerpt from the book Why Nations Fail, a seminal work on the subject by two of the world’s foremost economists, could relate to the Pakistan of today. More than seven decades after its formation, Pakistan remains one of the poorest nations, sliding behind regional countries on almost all social and economic indicators. 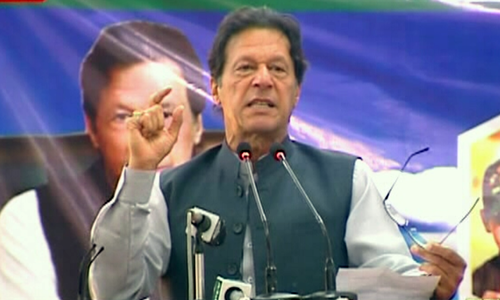 Although we pride ourselves as being a nuclear-armed state, the security of the country is threatened by a failing economy, population explosion, poverty and environmental degradation. A massive youth bulge and a rising uneducated and unskilled population with few prospects of finding productive employment present a terrifying scenario. But can this situation be turned around? Where will Pakistan be three decades from now when it crosses the 100-year mark? In its landmark report, Pakistan@100: Shaping the Future, the World Bank projects two scenarios. One would take Pakistan to a $2 trillion economy by the year 2047, placing the country in the middle-income Second World group. This is a highly optimistic scenario that requires the country to achieve sustainably high economic growth rates for approximately the next three decades. Pakistan’s situation today suggests that it will not be able to generate a demographic dividend. The second scenario is extremely depressing. Failing to change the country will cause it to slide further into the abyss of poverty. Pakistan today is standing at a crossroads and, as the report warns, decisions over the next decade will decide Pakistan’s future. It all depends on whether we are willing to change the extractive nature of the state institutions that mainly serve the interests of a small ruling elite, and so remove the fetters that prevent the country from embarking on the path of economic growth and social progress. A major challenge is how to transform a crumbling institutional structure and address the key constraints to economic growth. Pakistan will have to overcome the barriers to structural transformation that have been stifling its development in previous decades. Partial and half-hearted reforms cannot take Pakistan out of the current morass. It is not just about economic growth but also the welfare of the people that matters. One of the major reasons for our backwardness, as pointed out by the report, has been low investment in developing human capital. Investments in family planning, maternal health and early childhood development are the foundation of human capital accumulation. The empowerment of women is a key component of efforts to increase human capital in Pakistan. “A first priority for Pakistan is to make the best use of its greatest asset, its people,” the report said. Pakistan has one of the highest population growth rates in the world, offsetting efforts to improve social indicators. With a 2.4 per cent growth rate, Pakistan’s population has crossed the 208 million mark, making it the fifth largest populated country. It is sitting on a potential demographic disaster with more than 60pc of its population under 25 years of age. The number of individuals ready for the labour market is expanding faster than the total population. 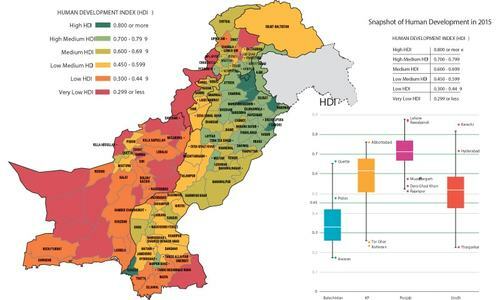 According to the report, Pakistan’s situation today suggests that it will not be able to generate a demographic dividend. The inability of the state to productively utilise a large young generation has already turned the country into a breeding ground for violent extremism, and could cause further social dislocation and conflict. The fertility rate in Pakistan is far higher than that in other regional countries. The population growth rate must be brought down to 1.4pc to achieve the goal of entering the middle-income group. But there seems no urgency to contain the population explosion. Regional conflicts have also been a strong factor in exacerbating Pakistan’s economic woes. Strained relations with neighbours have closed opportunities for economic cooperation and the expansion of trade. Hostile borders and the country’s being a front-line state in the Afghan wars over the last four decades has had huge costs in both economic and social terms. The blowback of the conflict in the region has turned Pakistan itself into a battlefield. The internal security problems have also affected foreign and domestic investments, retarding our economic growth. High expenditure on defence leaves few resources for economic and human infrastructure development. Peace could open up massive opportunities for expansion of trade and economic cooperation. A transition from a national security state to a social welfare state is critical to shaping Pakistan’s future. 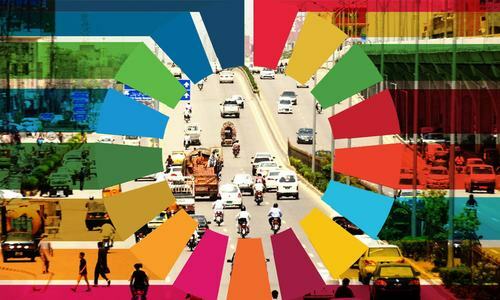 Increased regional cooperation and connectivity must be a top priority in order to achieve structural transformation and a stronger economy. Higher investment in economic and human development will also ensure our national security. The traditional approach of security is becoming increasing unsustainable. Pakistan occupies a pivotal position in what is described by Peter Frankopan, an Oxford professor, as a ‘silk road’. According to the author of The New Silk Roads, “We are living in the Asian century already, a time when the movement of global GDP from developed economies of the West to those of the East is taking place at an astonishing scale and at an astonishing speed”. Its geographical position provides Pakistan a massive opportunity to transform the country into a trade and transit hub. Surely CPEC, which is the flagship project of China’s ambitious One Belt One Road scheme, can open up vast economic and connectivity opportunities for Pakistan. Given its geostrategic position, Pakistan has the potential to serve as a nexus for the two routes envisaged under OBOR — the continental Eurasian ‘silk road economic belt’ and the Southeast Asian ‘maritime silk road’. According to the report, increasing regional integration within South Asia could cause Pakistan’s economy to expand by 30pc by 2047. Stronger regional relations can support Pakistan’s economic transformation and security objectives, increasing its leverage to resolve disputes with its neighbours and freeing up resources for public investment in economic and human development. But that requires a clear strategy for greater integration with other countries in the region. With clear policy direction and political will, Pakistan could join the other countries as a formidable economic power at the age of 100. Ok fine, but what to do with circular debt, increasing 2 billion per day? NATIONS fail economically because of extractive institutions....Very bold statement indeed. The country will take the right ones if people can get out of their own way. Well said. However, how many will listen? Another Great writing from Zahid Sahab... But as i always said..... Who is listening? Instead of enjoying a "GeoStrategic" position, Pak has to create a "GeoPolitical" standing. This is will make Pakistan as we all wish and hope for. High expenditure on defence leaves few resources for economic and human infrastructure development... the elephant in the room. Investment on human development is more important than expending billions on military and defence. Japan was devastated after World War II but it was successful in emerging as a very strong economy after this. How did Japan achieve this marvellous success? Answer lies in human development. Successive Japanese governments invested more in education, health and social security of its people. But I always view a dark future if all the residents are not made aware on current situation. Thank you for a great piece. Current pakistan gov may or may not have the right answers to the right questions, but it is the wrong answers to stupid questions that got us here in the first place as witnessed in the past 18 yrs. So first thing is first, you dont runs a hospital by keeping it dirty. Similarly Pakistan needs proper cleaning to promote hygiene, especially in politics before it can sprint. I appreciate Zahid Sahib's able summing up. However, having served the government for 36 years (in the highest positions, including Cabinet Secretary), I must add that its government machinery that provides the framework for all the actions to make Pakistan vibrant that are mentioned in this article. Unfortunately, the quality of government personnel is very poor; moreover, the very draconian interpretation of administrative actions by NAB and FIA have rendered most government employees wary of taking any action. Indeed with virtually assured life long employment, government employees often state that there is no punishment for "doing nothing but appearing busy". Indeed most of us just push pens and shuffle paper. The few SOPs on time actions that exist are hardly followed. The laws are so complicated that even where action is desired, one barricade is placed after another hurdle. As someone said of the making of Grand Canyon in a million years, "was it a government project?" @NVV, "Another Great writing from Zahid Sahab... But as i always said..... Who is listening? Instead of enjoying a "GeoStrategic" position, Pak has to create a "GeoPolitical" standing. This is will make Pakistan as we all wish and hope for." Well Articulation !! Pakistan’s economic transformation requires a clear strategy for greater integration with other countries in the region. Decisions over the next decade will shape Pakistan's future. Will the country take the ominous ones? Somebody should listen to these wise words at least while fast asleep. Excellent piece of article by Mr Zahid Hussain, the extracting institution like Nandipur Project, Pak Steel Mill,PIA, are sucking the fresh blood, these may be sort out. Other shortfalls may be tackled by addressing the graft cultures, and people not willing to come into tax net and pay taxes. The Govt expenditures perks availed by legislators, and CM Houses,Governor Houses, huge expenditures, can be curbed. And last but not least to resolve all issues with neighbors through talks, hence save huge expenditures. You did listen. So thank you! I can sumo up that Pakiatanis should not vote for ppp and pmln for the next ten years as both parties are on the same agenda of corruption and anti pakistan marrative. Pakistan can make good progress if it views its citizens as it's most precious resource and not cannon fodder to be brainwashed and used for some strategic battles. Without normalisation of relationships with neighbours, Defense expenditure with continue to consume most of the States revenue and left unchecked can bankrupt the country. @Syed Akif very pertinent observations which ironically harken back the competent and efficient handling of affairs of Government by inherited ICS cadre in 1950s and 60s.Never too late in life of nations to learn lessons from history subject to political will. @SH_khan, circular debt mainly arises due to subsidy on petroleum products. Stop the subsidies and circular debt stops from that time. @Zak, it is not the only issue but a significant issue. @Worried Indian, if you can convince your Indian leaders to stop interfering in Pakistan issue and conduct a plebiscite in Kashmir, defense expenditure will reduce substantially in both India and Pakistan.